YANCEY, William Lowndes, (uncle of Joseph Haynsworth Earle), a Representative from Alabama; born at the Falls of the Ogeechee, Warren County, Ga., August 10, 1814; attended preparatory school and Williams College, Williamstown, Mass. 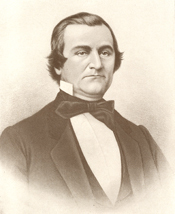 ; studied law in Sparta, Ga., was admitted to the bar in 1834 and commenced practice in Greenville, S.C.; moved to Cahawba, Ala., in 1836; temporarily abandoned the practice of law and became a cotton planter; editor of the Cahawba Democrat and the Cahawba Gazette; moved to Wetumpka, Ala., in 1839 and resumed the practice of law; member of the State house of representatives in 1841; served in the State senate in 1843; elected as a Democrat to the Twenty-eighth Congress to fill the vacancy caused by the resignation of Dixon H. Lewis; reelected to the Twenty-ninth Congress and served from December 2, 1844, to September 1, 1846, when he resigned; moved to Montgomery, Ala., in 1846; delegate to the Democratic National Convention in 1848, 1856, and 1860; member of the State constitutional convention which convened in Montgomery January 7, 1861; appointed chairman of the commission sent to Europe in 1861 to present the Confederate cause to the Governments of England and France; elected to the first Confederate States Senate February 21, 1862; died at his plantation home, near Mongtomery, Ala., July 26, 1863; interment in Oakwood Cemetery. Walther, Eric H. William Lowndes Yancey and the Coming of the Civil War. Chapel Hill: University of North Carolina Press, 2006.;Draughon, Ralph Brown, Jr. William Lowndes Yancey: From Unionist to Secessionist 1814-1852. Ph.D. diss., University of North Carolina at Chapel Hill, 1968.